—By providing a speaker for men’s ministry events such as breakfasts, dinners, seminars, and retreats, as well as unique printed materials for Christian men. 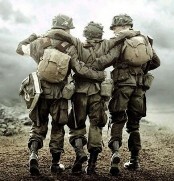 —By providing the tools men need to get connected and become a true band of brothers in the spiritual battle. —By providing coaching to assist churches to build effective, sustainable, disciple-making ministries for men. “God used you to turn my husband’s life completely around. He is now a Spirit-filled Christian. It all happened at the Great Dads Seminar you led. THANK YOU SO MUCH.” The wife of a man who attended the Great Dads seminar. Family Builders, Inc. is a 501(c)(3) non- profit ministry, gifts to whom are fully tax deductible. If you would like to support our ministry through an online donation through your credit card or PayPal, click the donate button.